BIG SCOOP A computer rendering depicts the entire 600-meter-long Ocean Cleanup system floating in the North Pacific, as currents push the edges of the boom to form a u-shape. The system is designed to scoop bits of plastic for later collection and removal by support vessels. The days of the great Pacific garbage patch may be numbered. A highly anticipated project to scoop up plastic from the massive pool of ocean debris is poised to launch its first phase from Alameda, Calif., on September 8. The creators of the project, called the Ocean Cleanup, say their system can remove 90 percent of the plastic in the patch by 2040. First proposed in a 2012 TED talk by Dutch-born inventor Boyan Slat, who was then just 18 years old, the Ocean Cleanup's system consists of a snaking line of booms designed to simulate a kind of free-floating coastline that can essentially herd the plastic trash into retrievable piles. The project, based in Delft, the Netherlands, has drawn more than $30 million in donations from sponsors, philanthropists and a crowdfunding campaign. It has also drawn the ire of researchers who worry about possible negative effects on ocean life, or who say the project doesn't address the majority of ocean plastic - bits called microplastics that are smaller than half a centimeter. The system is designed to capture pieces of plastic ranging in size from a few millimeters to tens of meters across, such as fishing nets. Critics also worry the project will divert attention and money from the root of the problem: too much plastic waste in the first place. A March study in Scientific Reports, led by Ocean Cleanup's lead oceanographer Laurent Lebreton, estimated that in 2015 the great Pacific garbage patch was scattered across some 1.6 million square kilometers - an area twice the size of Texas - within a vast ocean swirl known as the North Pacific gyre. The patch, the study found, contains about 1.8 trillion pieces of debris, largely consisting of buoyant plastics like polyethylene and polypropylene, floating at the surface (SN Online: 3/22/18). Most of those pieces are smaller than half a centimeter - but by mass, more than 90 percent of the patch is made up of pieces 5 centimeters or bigger, the scientists estimate. It's those larger pieces that the cleanup system will snag. 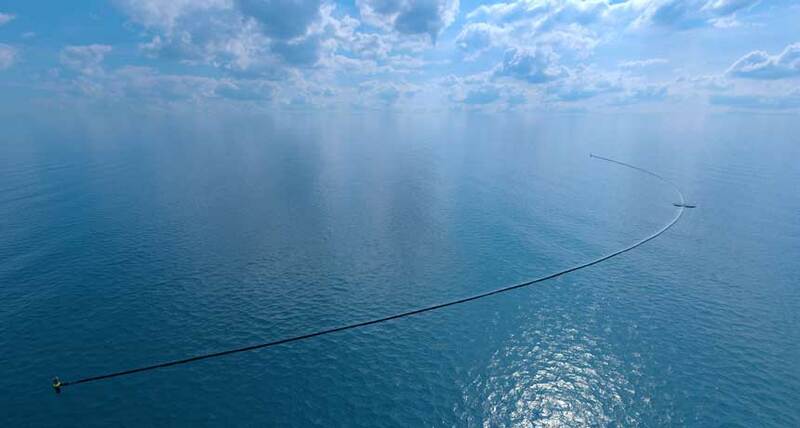 The system features a 600-meter-long line of unmoored booms that act as an artificial shoreline traveling with the wind, waves and ocean currents while rounding up plastic debris. Beneath the surface, the booms drag a 3-meter-long skirt, through which only the tiniest bits of plastic can escape. Currents will naturally push the line of booms into a u-shape, herding plastic particles so they're easier to collect. The booms are also tricked out with solar-powered lights, anti-collision systems and satellite antennas to avoid vessels and help project scientists keep track of the system's location. Periodically, support vessels will cart the collected plastic bits back to land for recycling. The September 8 launch of "System 001" will be a beta test for the first of a planned fleet of about 60 such systems, though parts of a system have been tested for durability and performance in the North Sea and off California. Once launched, System 001 will undergo two weeks of field testing off the California coast, Lebreton says. If all goes well, it will head to the North Pacific gyre, arriving within five weeks of the launch date. "We're hoping to bring the first plastic back before the end of the year," he says. Once the full fleet is launched, Ocean Cleanup says, it could remove 50 percent of the plastic in the patch within five years, and 90 percent by 2040.